This exhibition of student work is the result of a partnership among the MIA and Austin High School, Thomas Edison High School, El Colegio Charter School, and Humboldt Secondary School. 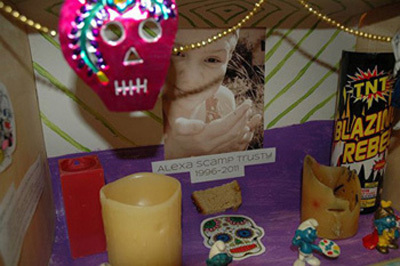 Students explore world cultures’ reverence for ancestors through Mexico’s Day of the Dead traditions. They create personal ofrendas (shrines) to honor friends, family, or community members who have died. You can find the new blog here.